There are some active communities in the area (see active communities link at right). Home prices in the fourth quarter of 2017 was $129,000, according to the National Association of Realtors. Home to Fort Bragg, the 82nd Airborne, and the U.S. Army Special Operations Command. It is a very friendly place for military families. The crime rate is very high. The average January temperature is about 41 degrees with the average July temperature 80 degrees. Fayetteville is considered the world's first sanctuary for soldiers and their families. Time Magaziine recognized the community as "America's Most Pro-Military Town". The crime rate in Fayetteville is very high, more than double the national average. Fayetteville has a commercial airport, Fayetteville Regional/Grannis Field. I 95 runs through town, and there is an Amtrak station. 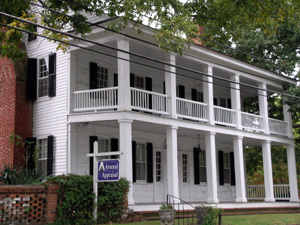 Fayetteville Convention and Visitors Bureau.